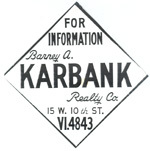 Below please find Karbank Real Estate Company’s Available Properties for January 2015. Please contact the individual broker or our office at 816.221.4488 for more information on a specific property. Previous post: Making Progress at 1900 Shawnee Mission Parkway!